Face Value: Picture books tend to have good covers, since, well, obviously the pictures are a little more essential to the packaging. 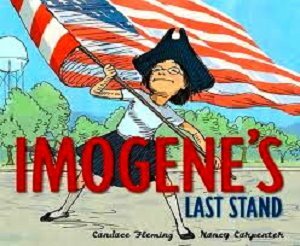 This cover, with Imogene proudly, defiantly and patriotically waving her flag and the bold red and blue letters is just about perfect, reflecting the gorgeous illustrations by Nancy Carpenter throughout the book. Does it Break the Slate? Yep, shatters it in about a million different ways. From the overarching concept – a history-loving girl battles to save her small town’s historical society from being turned into a shoelace factory – to the minute details, like the fact that one of the police officers and the president are female. Imogene Tripp might emulate great heroes from American history, but any reader will easily see that she is a hero in her own right. Who would we give it to? This would make a great classroom read. It manages to make a political stand without making a political statement, and is a great lesson in activism and civic engagement. I also think it would make a fantastic play, given the strength of characters, clear story arc and dramatic problem solving. So if anyone wants to start working on that adaptation (or could get me in touch with Candace Fleming) please let me know. Review: Candace Fleming is amazing. She really is. From her epic-yet-personal, impeccably researched non-fiction (see Brianna’s review of Amelia Lost, for example) to classic read-alouds like Muncha Muncha Muncha, she has an astonishing range of high quality books for young people. And many of them deal with tough, smart girls and women. But when I found Imogene’s Last Stand on the shelves at my local library, I couldn’t believe how fantastic it was, not to mention how ideally suited to ME, a feminist history-lover. Fleming packs a lot into this picture book. 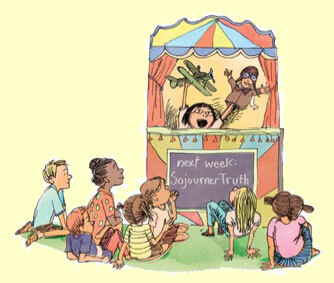 Imogene Tripp is a little girl who lives in Liddleville, New Hampshire who absolutely loves history. “When she was a baby, her first words were ‘Four score and seven years ago.’ As a preschooler, she finger painted an accurate map of the Oregon Trail. And as a kindergartner, she used her show-and-tell time to give a series of lectures on important women in history.” Take a look at this picture of Imogene with the Amelia Earhart puppet and just try to tell me your nerdy-girl heart doesn’t melt. And it doesn’t end there. 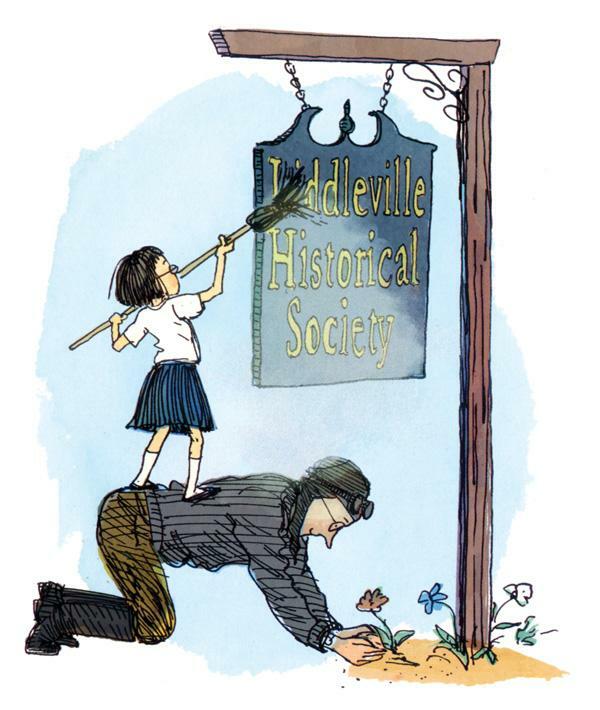 When Imogene discovers the Liddleville Historical Society, she makes it her personal mission to transform it into a tourist destination. But when no one comes, the Mayor I.M. Butz decides to tear down the society to build a shoelace factory. Faced with a challenge, Imogene doesn’t back down. As she shouts to Mayor Butz, when he tells her that shoelaces will put the town on the map, “I won’t let it happen! In the immortal words of John Paul Jones, ‘I have not yet begun to fight!’” It isn’t easy being an activist. But Imogene perseveres and manages to not only save her beloved society but get the President of the United States on her side. One might think that will all of these messages and historical goodwill that this book would have to be on the dry side. And yet it isn’t, not a bit! The storytelling is sharp and smart, with clever details sprinkled throughout the book. The pictures add just the right intensity to the story and the book comes to a genuinely satisfying emotional resolution. Plus, it’s not just the big picture of this book that’s Slatebreaking. There are a whole lot of tiny details that shatter pieces of the slate in small but monumental ways. Take, for example, the fact that Imogene is being raised by a single dad. It’s not made a big issue, but I love seeing all kinds of families depicted in the picture books I read. Not to mention the fact that Imogene’s dad is awesome – he worries about his daughter’s safety, but ultimately supports her and her cause 100%. But we don’t see Imogene as the lone female in an all male world. The police officer who tries to talk Imogene out of her protest is female, as is the historian she turns to for help. And when the President of the United States shows up, she turns out to be a Black woman. Fabulous. Teachers, as we head into election season, and a time when politics can get incredibly vicious, it can be hard to talk with your class about politics and activism. But this book opens up a conversation about what it means to be an activist, and to stand up for the things you believe in without discussing specific politics or party lines. It would be a great addition to your election-based curriculum. This entry was posted in Picture Books, Reviews and tagged Activism, Candace Fleming, Feminism, history, patriotism, picture book, Read-aloud. Bookmark the permalink.